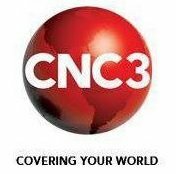 General TV Channel / CNC3 Television (CNC3) is a television station privately owned by Guardian Media Limited serving Trinidad and Tobago. It broadcasts over-the-air on channels 12 and 14 and is seen throughout the Flow cable system on channel 3. CNC3's studios are located at the Trinidad Guardian building located on 22-24 St. Vincent Street, Port of Spain, Trinidad and Tobago.